“The One I Love” has its Madison premiere at 7 p.m. Thursday, Nov. 20 at the Union South Marquee Theatre, 1308 W. Dayton St. as part of the UW Mini Indie Film Festival. R, 1:31, three stars out of four. FREE! “The One I Love” premiered at the Sundance Film Festival last January, was in theaters and on video-on-demand over the summer, out on DVD this fall and will be on Netflix Instant next week. So it’s been out there. And yet, I find myself inclined not to spoil anything that happens after the first 18 minutes of the movie. Part of it is not to incur the wrath of spoiler Nazis, obviously. But part of the fun of author Charlie McDowell’s first feature is to experience the bizarre turns that Joshua Lader’s screenplay takes along with its two main characters, to puzzle things out along with them, and see how the react to each new revelation. So here are the first 18 minutes. 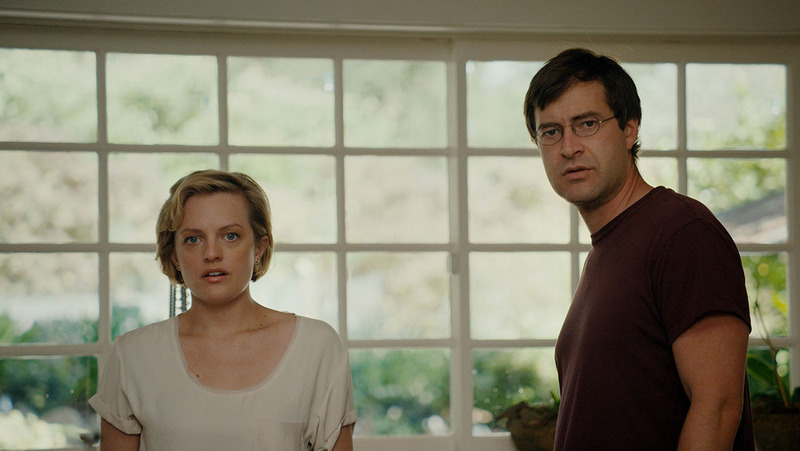 Ethan (Mark Duplass) and Sophie (Elisabeth Moss) are an estranged married couple seeking therapy from a psychiatrist (Ted Danson). They’re in a classic middle-age married rut, heightened by Ethan’s infidelity. Everything they say to each other carries the weight of years of old baggage, unfinished arguments and unexamined regrets. There’s a scene where Ethan and Sophie play tic-tac-toe, which seems like a strangely perfect metaphor for marriage — an evenly matched competition that always ends in a tie. And yet we still keep playing. At one point they try to rekindle the old spark by recreating an a nocturnal swim they shared on the night they first met. It doesn’t work. They’re not those people anymore. The doctor offers them the use of his country house for the weekend for them to retreat and work on themselves. Things seem to be going . . . okay. And then they decide to explore the guest house. And I’ll stop there, which I know seems weird. Suffice to say that “The One I Know” takes a major shift and becomes a bracing mix of relationship drama, indie comedy and “Twilight Zone” episode. Duplass and Moss, who basically carry this movie on their own, display enormous chemistry in several different ways on screen, as a long-time couple who continue to excite and aggravate each other. Watching them face the unexpected, then try and see the possibilities in it, is a lot of fun. Without giving anything away, “The One I Love” explores the possibility of enduring love between two adults who are by their nature changing, and whether we love the person that our partner becomes, or will always prefer the person they once were. “The One I Love” is at its best when its human and oddball elements are in perfect harmony, one illuminating the other. In the third act, Lader loses sight of that a little, falling into a fit of over-explaining when, frankly, there’s no explanation that would properly answer all the questions raised in the film. It would have been better to keep things a complete mystery from start to finish, since what matters to us isn’t what’s happening, but how what’s happening affects Ethan and Sophie. But this is still an intriguing movie that, for all its metaphysical puzzles, knows there’s nothing weirder than the human heart.